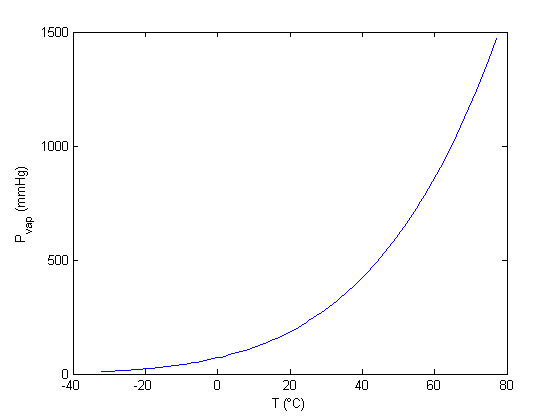 plot vapor pressure of acetone over the allowable temperature range. save the database for later use. To use this data, you find the line that has the compound you want, and read off the data. You could do that manually for each component you want but that is tedious, and error prone. Today we will see how to retrieve the file, then read the data into Matlab to create a database we can use to store and retrieve the data. which we represent by '%d%s%s%f%f%f%f%f%s%s' as a format string. Note we are basically ignoring the contents of the last two columns, and just reading them in as strings. The output of the textread command will be a vector of values for each numerical column, and a cell array for string data. the output of the textscan command is a cell array of all the data read in. This makes it easier to read the code where we assign the database. Each of these varialbes is a column vector containing the data for that column in our text file. % That's it! Now, we can use the database to retrieve specific entries. 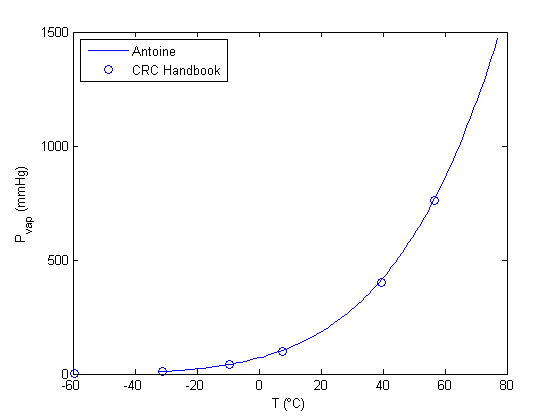 We only include the data for the range where the Antoine fit is valid. % There is pretty good agreement between the Antoine equation and the data. we can load this file into Matlab at a later time instead of reading in the text file again.